Rev. 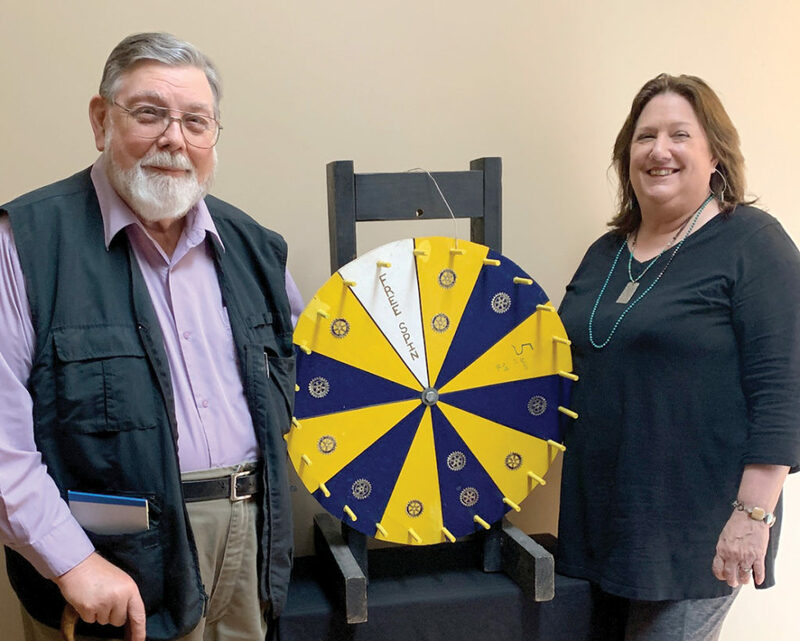 Richard Teeter, alumnus of the first DeQuincy Rotary Club, and Jeffra DeViney, membership chair for the current club, are shown with the Rotary Wheel from the first Rotary Club. Club members who missed meetings or forgot to wear name badges had to spin the wheel to determine a fine. The wheel was donated by Gay Ann Blagrave who got it from her brother-in-law Ronald Mazilly, the treasurer of the former DeQuincy Rotary Club. DeQuincy Rotary Club will meet on Wednesday, Apr. 10, at DeQuincy United Methodist Church Fellowship Hall at 12 noon. Heath Hairgrove, DeQuincy Memorial Hospital C.E.O., will be the guest speaker. To date, the non profit club has enrolled 25 new charter members. Zachary Deal, Premier Pools & Spas; Melica Richardson, World Finance; Vincent Lombardo, 5-Star Soft Wash; Rev. James Harris, Evergreen Baptist Church; Chantelle Smith, Unitech Training Academy; Ashley Mazilly, Beauregard Electric Co-op; Jack Marcantel, Tigerland Truckstop & Grocery and Heather Ripley, Tiger Tyme Tees and Athletics. The first official project for DeQuincy Rotary club will be to host a Rotary Booth at Louisiana Railroad Days Festival on Saturday, Apr. 13. The “Rotary Tent” will be located in front of DeQuincy Railroad Museum on the grass. Come meet and greet with Rotarians, find a place to sit out of the sun, sign-up to join the club and take a chance on winning a great prize in a random drawing. DeQuincy Rotary Club follows the legacy of a previous charter in DeQuincy that held a 70 year tenure. The club meets twice a month on the 2nd and 4th Wednesdays of each month at 12 noon for fellowship, education and creation of community projects to serve on a local and international level. Noon luncheon meetings are held at DeQuincy United Methodist Hall on the 2nd Wednesday of the month; and, on the 4th Wednesday at El Tucan Mexican Restaurant. The club is the cornerstone of Rotary where the most meaningful work is carried out. All effective Rotary Clubs are responsible for four key elements: sustaining and increasing their membership base, participating in service projects that benefit their own community and those in other countries, suppporting the Rotary Foundation financially and through program participation, developing leaders capable of serving Rotary beyond the club level. Rotary is where neighbors, friends and problem solvers share ideas, join leaders and take action to create lasting change. Rotarians welcome fellow Rotarians to their meeting across the world. You can make up a meeting or participate in another club’s project at any Rotary Club. Rotary is the most financially sound, largest and most powerful networking service organization whose flag is recognized in more countries than any other flag in the world. Every minute of every day, Rotary feeds someone, houses someone, vaccinates someone, comforts someone and provides clean water to someone. Rotary recently celebrated its 114th year anniversary. Rotary members pool their resources and talents to serve their communities. Our dedication to this ideal is best expressed in their motto: Service Above Self. Rotary also embraces a code of ethics, called the 4-way Test which reads: “The 4-way Test of the things we think, say or do. 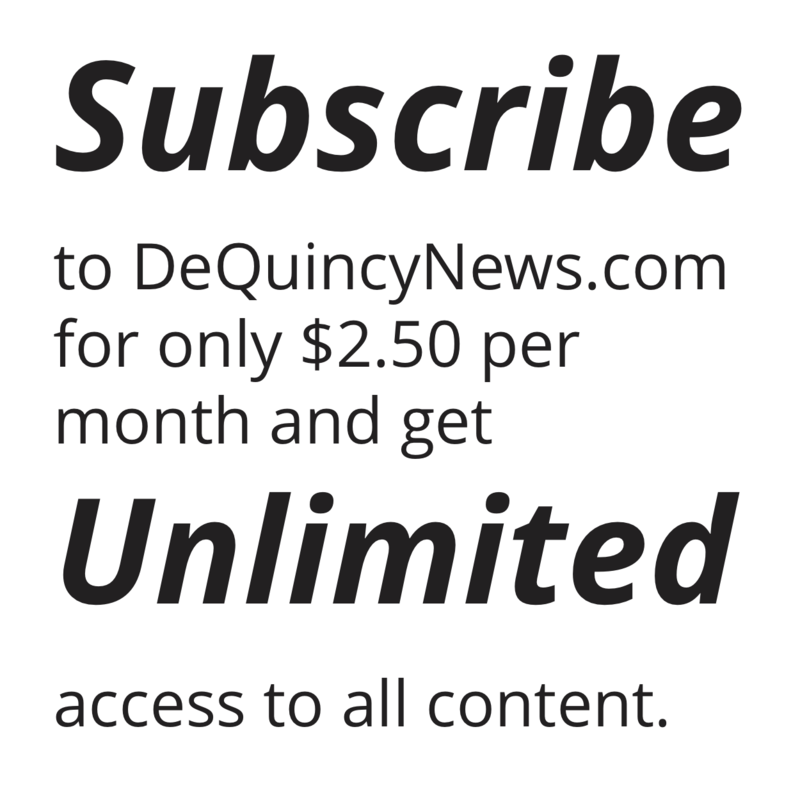 DeQuincy Rotary Club to date, has one alumni member from the former DeQuincy Club, Rev. Richard Teeter. Jeffra Wise DeViney and Kyle Carlson promote the legacy of their fathers, Jerry Wise and Alex Carlson, who were fellow Rotarians in the former club charter. DeQuincy Rotary club membership for new charter members is still open. Interested persons can stop by the booth at the festival or call 337-912-5063 Jeffra DeViney, membership chair, for more information. Check the club out on Facebook at DeQuincy Rotary Club and watch for articles in the DeQuincy News weekly.